Along with a crisp breeze heralding winter's imminent arrival, Jasmine Fairchild knew that change was coming to Cedar Springs, Colorado. The town had been in a slow down-hill spiral ever since the train had been routed around their town. They had the occasional coach arrivals, but this time, the coach brought Quentin Smith. The Quentin Smith, subject of dime novels, ex-Texas Ranger, and a man Jasmine knew she shouldn't even dare dream about. After all, she was just a bar-girl who barely managed to keep her reputation intact. Quentin had been hired to track down murderers, and he couldn't afford to divert his attention from his quest. More people could die if he didn't identify and make the arrests. The longer he is in Cedar Springs, the more he realizes that this is the type of town a man could choose to make his home, and Jasmine was the woman he would want as a wife. He was also making friends. He didn't want to put any of them in jeopardy, but he needed to rely on their information to apprehend the suspects. If he didn't, he wouldn't have anything to offer Jasmine. Suddenly, You was a delight to read. Both Quentin and Jasmine must overcome roadblocks that they made for themselves. They must learn to accept who they are and where they've come from in order to find a future with each other. It was a pleasure watching these two grow. Equally enjoyable were the assorted secondary characters in Cedar Springs. 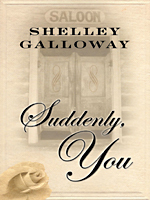 Again Shelley Galloway has written a Keeper.